Gotra, Eir Spawn is a Hive Wizard encountered in the Lunar Complex of Old Russia during The Dark Within mission. Gotra attacks using heavy ranged magic attacks and appears to possess the ability to summon flames as protection. Gotra also has the ability to emit a black cloud of mist that can impair a player's line of sight and poison them temporarily. 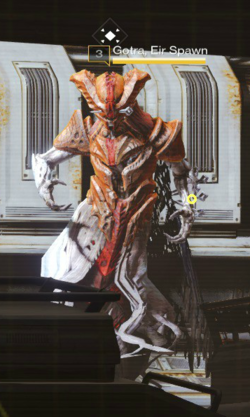 Gotra is the first named Hive enemy The Guardian encounters. ↑ Bungie (2014-6-12) Destiny: Alpha, Hidden Swamp. PlayStation 4, Activision Blizzard.